The Big Bad Wolf is in town but the three pigs are not backing down. 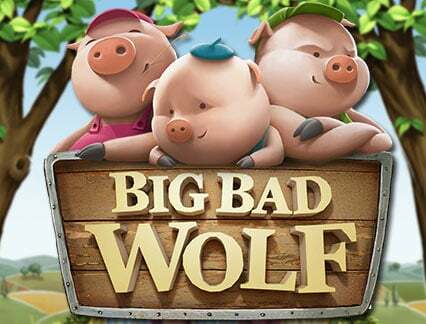 Experience this awesome slot while seeing the pigs through their journey of survival and taking refuge from the villain wolf. With the Big Bad Wolf trying to huff, puff and blow the pigs’ houses away, you can win cash through awesome features as you watch the story uncover. The exciting slot which has 5×3 reels and 25 paylines, creates a constant flow of winning spins and makes the pig symbols wild in the process. Enjoy the feature-filled game and see where the story ends. See this classic story unfold through a slot game and stand a chance to win big. With every second swoop, one of the three Pig symbols will turn into a wild symbol. The fourth swoop results in 2 wilds and 6 consecutive swoops will result in all three pigs turning wild. This feature is triggered by all winning combinations. After they all disappear, new symbols drop down to replace the empty spaces. This gives you more chances to win if your blocks keep on matching. This action can continue several times until there are no new winning combinations. The new wins will get added on to the existing win and multiplied by bet per line. Free Spins will be awarded when 3 or more Big Bad Wolf scatter symbols appear on the screen. You will be awarded with 10 Free Spins, and you can get up to 14 Free Spins if the blowing Down the House feature is activated during the Free Spins session. This feature happens during the Free Spins feature, when the full moon symbol appears on the left hand corner of the screen. When you collect 3 moon symbols, you will get 2 additional Spins right before Big Bad Wolf appears and blows down the house. If you collect 6 moon symbols, this will also trigger the blowing down the house feature, and awards you 2 additional Spins and multiply your wins by 2! You can adjust the speed of the reels with the Play Fast button or activate the auto play which allows the reels to keep spinning without you pressing every time. Enjoy this fairy tale slot and take full advantage of the fun-filled features while the pigs run from house to house avoiding the Big Bad Wolf. Have fun with the incredible graphics as you swoop for cover with the three pigs. Help the pigs hide and pocket some cash while you’re at it!